Launch your Juice Plus+ Virtual Franchise! Have fun and share your story! Don't EVER send out a mass email/facebook message. You will ruin your warm market. Be subtle on social media. You want your friends to ask YOU why you are so healthy and happy. Lead by example. Understand that you are NEVER bugging your sponsor and your support line. It's our job to help YOU be successful. Communicate with us as often as you can. You don't need to become an expert before you get started! Earn as you learn and let us help you! Always remember: this business can fuel your FUN and it can fuel your FULFILLMENT, if you let it. You can skip this if you've already watched it! Get Ready with Your Sponsor! Please be sure to add info@e.juiceplus.com to your contacts, address book, and/or your safe senders list. This will help ensure that you don't miss any emails from The Juice Plus+ Company. After receiving your username and password email, log into your Virtual Office at www.jpvogo.com and bookmark the site. Download this Getting Started Guide - sit down with your sponsor and work through it, completing each step. It should not take more than 30 minutes. Join our Team Eagles Monday night Zooms and other Team Calls. Get Set with a Goal! Work with your sponsor on an initial Goal and your Why, using this worksheet. Your first Goal in building your Juice Plus+ Virtual Franchise is to win a $100 Healthy Living Plan bonus. 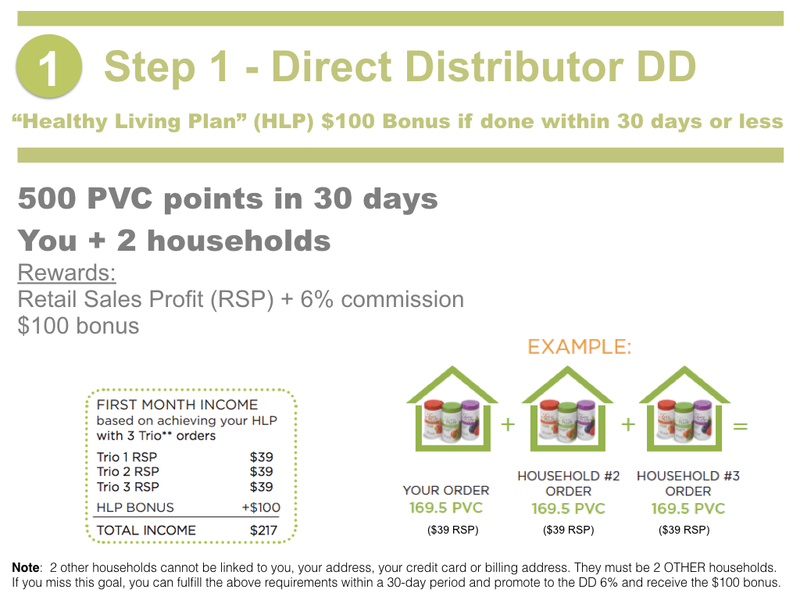 This Fast Track also promotes you to "Direct Distributor" and you start earning a 6% commission. This is really simple: just make a list of your "inner circle" - the people you know and love; those who know and love you. You will reach out to your favorites to find just two of them who want to order Juice Plus+. Then, when you have ordered your Juice Plus+ ... it's done! You have 30 days to do this, but it might only take 30 hours. The quicker the better: the HLP is the basic building block of your business; get it, do it, teach it ... duplicate. This is your Invitation List - your first, most important tool for your business. Start with at least 30 names - give your sponsor a copy. As you start your business keep adding names until you have 50+; then keep building your list until you have 100+. As soon as it's ready, give or send the document to your sponsor. Next, with your sponsor, discuss each person and plan the best approach for each before you contact them. Two or three of them will be your potential team members. While working on your memory jogger (in the next 48 hours) watch as many of the video clips at JPVideos.tv as possible. You will learn a lot, get very comfortable with our phenomenal product, and gain confidence and belief in what you are doing. Also, learn to use OnEaglesWings.tv. Work on your Juice Plus+ Story with your Sponsor. Juice Plus+ made sense to me because ___________________. Then practice by calling your sponsor and sharing your story. You will work together to perfect your stories, which you will use over and over with your list. Aim to get a hand full of customers (at least two) and, if possible, your first team member as quickly as possible. You will earn your first promotion, $100+ in profit and a $100 bonus, and you'll be well on your to a bigger Fast Track. You may find the simplest and easiest way to reach out to your friends and family is by texting them. Make a list of 10-20 people you would like to share Juice Plus+ with - your 'inner circle' - people you would love to benefit just as you and your family are benefitting. Then follow this guidance on Sharing by Texting. doing a 'Web Walk' Zoom for your 'inner circle' (this video training will explain). launching your business with our tried and proven Facebook Parties. Your sponsor will advise you on the best tools to use - ones that fit you. Then here are your Next Steps! What Should Your First Month (or two) Look Like?